Getting your school involved in raising awareness and funds for a worthy cause is a great way to encourage social awareness and responsibility among students of any age. Much like your school, we are committed to the futures of young people. 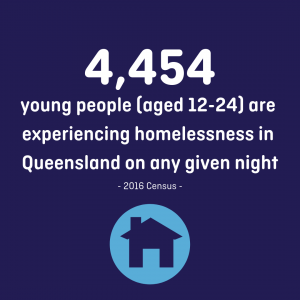 Around half of the young people we meet are experiencing homelessness. Homelessness is not just about the absence of safe and secure shelter. Often forgotten is the resulting exclusion from society and the emotional emptiness and isolation this breeds. Young people can easily become ‘cut off’, dropping out of school, unable to access vital services or engage and interact with the rest of the community. Intervening early in a young person’s experience of homelessness is vital to reduce their exposure to violence and trauma, and prevent them from losing hope for the future. Your school can help support them on their journey to a new future. There are many opportunities throughout the year around which your P&C Committee, Student Council, students, teachers or leaders could plan an awareness or fundraising activity, project or event. This could be as simple as sharing information or doing a project around the issue of youth homelessness and holding a free dress day for a gold coin donation.